A faculty member from the College of Engineering (CEN) at American University of Sharjah (AUS) was awarded the “Best Technical Note of 2018” by the American Society of Civil Engineers (ASCE). Written by Dr. Serter Atabay, Associate Professor of Civil Engineering, in collaboration with a former Head of the AUS Department of Civil Engineering, Dr. Ali Osman Akan, the paper was entitled “Suspended Sediment Trap Efficiency of Vegetative Filter Strips” and published in the Journal of Hydrologic Engineering. 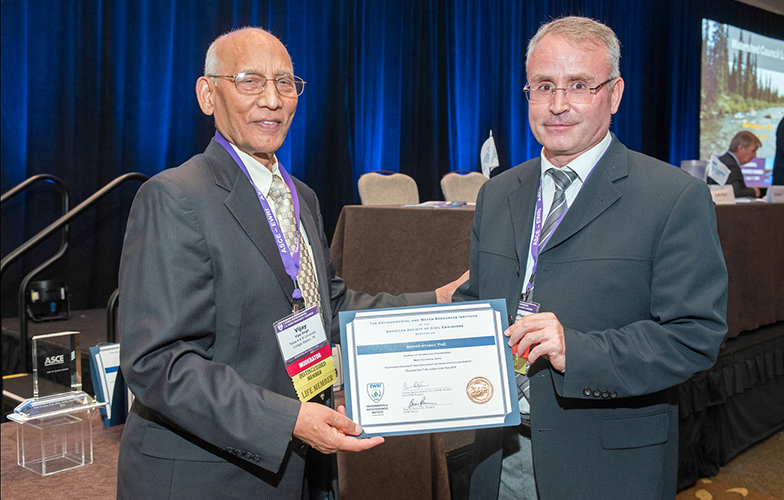 Dr. Atabay received his award during the Hydraulics and Waterways Council Luncheon and Awards at the World Environmental and Water Resources Congress 2018 in Minneapolis, United States this summer. The paper, which is an extension of a previously reported hydrologic study of vegetative filter strips to calculate sediment trap efficiencies, presents a set of charts developed using predetermined numerical solutions to the governing equations for overland flow, infiltration, and mass balance of suspended sediments in overland flow. The paper aims to serve those in the field of research including practical engineers, local authorities, transportation departments, and urban planners. This award will be posted and available on the journal's website throughout 2019.